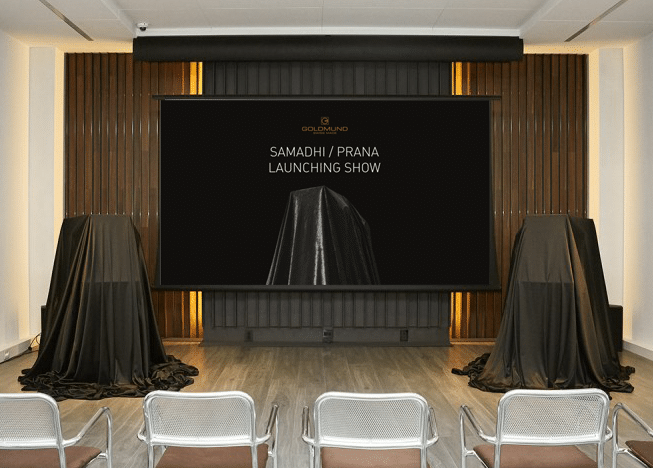 On 18 January 2019, the launch of two new Goldmund products – wireless stereo speakers Samadhi & Prana – was held at the Cheongdam Goldmund Flagship Store in South Korea. Several journalists, invited guests, and the general public attended and showed interest in the new floor standing speakers. During the first part of the event, Samadhi was unveiled and explained by Audio Gallery owner Mr. Sang Joon, Chief Researcher Dr. Veronique Adam, and Sales Director Rodolphe Boulanger. In between two product releases participants were offered appetizers and a string quartet performance by Mue String. The second part of the event introduced the Prana. Participants were presented the standalone loudspeaker features, its components such as the drivers, and conclude the event while listening to the Prana.